I tried to start this program first, and then setted breakpoint to line 5. But the breakpoint won't be reached. Sorry that should I provide more further information? 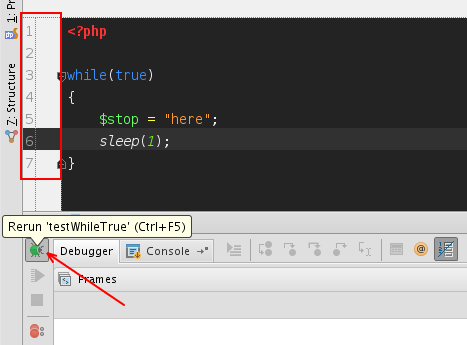 What have you done in PhpStorm as well as on remote side to set it up for such remote debug? Please let me clarify my problem again, I properbly miss the point. 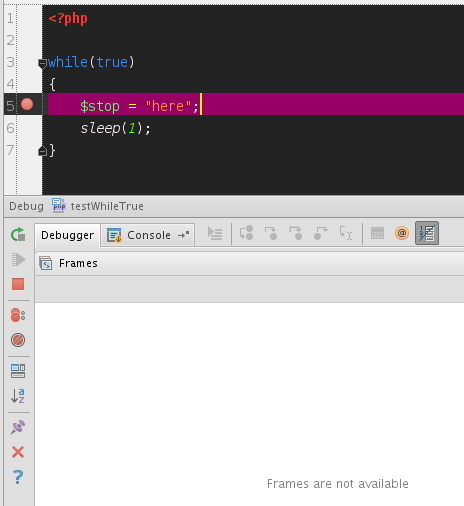 Actually I can debug on the simple program if I set the breakpoint before execute the program. But the breakpoint won't be reached anymore if I set the brakpoint after program be executed. In this case I will not be able to help you much -- I'm not a dev and do not do any of such remote CLI debug myself (don't even have an environment to test). Thank you again, I jsut tried another test. Debug this simple program on local machine. It still only work if breakpoints be setted before program start. Thanks for the remind, I tried to find anything useful on the debug logs. And I found xdebug's log won't be logged an event like 'breakpoint_set ......' if the program is running. But the event 'breakpoint_set ......' would be logged if the program is breaked into debug mode. 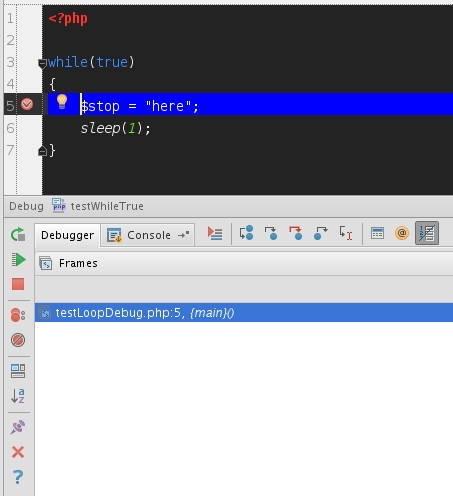 Can you please show a screenshot of the IDE when you attemp to set 2nd breakpoint at line #5 (after you already in debug session). 3. 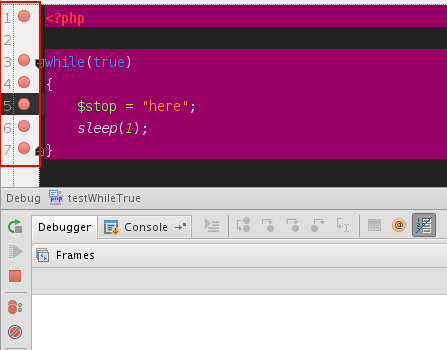 No matter which line be setted a breakpoint, it won't be stopped into debug mode. Thank you for detailed screenshots -- it clarifies a lot. AFAIK current behaviour is not a bug and is expected. As you can see from your screenshots (last post) none of the breakpoints have "tick" in it (means -- it is not registered). Breakpoint cannot be registered during actual script execution. 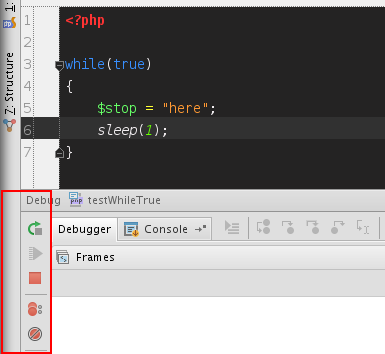 I mean -- it can be registered if script is "on hold"/being debugged right now, when xdebug awaits response from debug client (PhpStorm in our case) with instructions on what to do next. 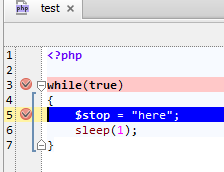 I do not know what you are debugging (considering your example) .. but maybe conditional breakpoint will be useful for you here (will only break if some condition is met). Obviously, it has to be set in advance. Thank you so much for the clearly explanation. It would really be great if breakpoints can be registered when script runs!